ConvaTec SUR-FIT Natura Two-Piece Mold-To-Fit Standard Opaque Drainable Ostomy Pouch Without Filter allows for draining. The plastic coupling ring allows the pouch and skin barrier to snap together for audible security. A simple snap-off, snap on design allows users to change the pouch quickly to match activities without removing the skin barrier from the skin. With streamlined body contour panels, low-profile design, and less headroom, they distribute pouch content more evenly and away from the stoma. - Begin by cleansing the peristomal skin with mild soap and water (soaps should be free of oils and creams). Pat dry thoroughly. The skin should be free of any solvent or greasy substances. 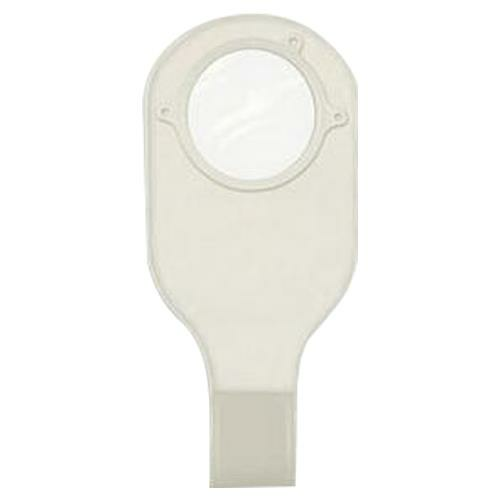 - Measure the stoma size with the measuring guide provided. Select a skin barrier/wafer with a flange (white ring) that is at least 1/2" (13mm) larger than the widest diameter of the stoma. If this size is not available, go to the next larger flange size. - Trace the exact stoma size onto the center white release paper in the back of the skin barrier/wafer. The small starter hole should be in the center of your tracing. - Cut along the tracing with curved, short-blade scissors. 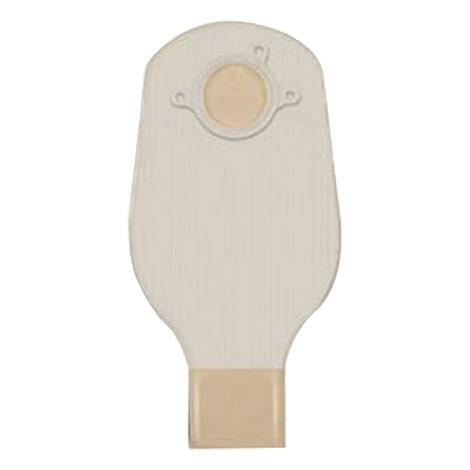 For skin barriers/wafers with precut stoma opening: Select a skin barrier/wafer with a precut stoma opening the same size as the largest diameter of the stoma. Do not enlarge the precut stoma opening. Remove white release paper from the skin barrier/wafer. Leave the outer release paper on the tape collar in place. - Center the skin barrier over the stoma. Press the skin barrier against the skin. If using a tape bordered skin barrier, remove the remaining backing paper one side at a time. - During application, maintain gentle pressure on the skin barrier for 30 seconds to improve adhesion. - Before attaching the pouch, allow a small amount of air to enter the pouch by gently separating it. - If you are using a SUR-FIT Natura drainable pouch with a clip, for attachment of the tail clip, fold the bottom of the pouch over the tail clip only once. Press firmly on the center of the clip until it snaps securely closed. - If you are using a SUR-FIT Natura urostomy drainable pouch with a tap, make sure the tap on the pouch is closed before attaching pouch to wafer. - Align the flange on the pouch with the flange on the skin barrier. Press them together beginning at the bottom and circling around the top side of the flange. You will hear several clicks as the system locks into place. - To easily remove the pouch from the skin barrier, gently pull downward on the plastic pouch tab and lift the pouch off. Anchor the wafer by holding it down with your other hand. - Filter covers are waterproof and should be used when bathing or swimming to prevent the filter from becoming wet. Remove filter cover after patting pouch dry. - Gently pull the skin barrier down, away from the skin, while supporting the adjacent skin with your other hand. To assist with the barrier removal, an AllKare Adhesive Remover wipe may be used to remove any adhesive buildup.